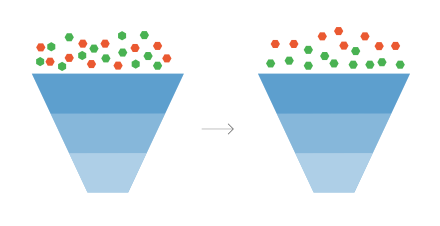 Segmentation is at the heart of the best marketing campaigns. It allows marketers to target prospects with a high propensity to convert and increase conversions by using the right marketing mix, as opposed to expending resources on the wrong prospects, or creating the wrong offers to the right prospects. Many forward-thinking marketing executives are turning to predictive analytics for greater insight into their customers and markets. Granular segmentation allows you to instantly visualize the signals shared among your best customers, which provides a comprehensive view of your ideal buyer profile. A deep understanding of your customers is the first step toward properly aligning product offerings and go-to-market requirements against customer segment needs. Predictive technologies allow you to run dynamic addressable market analysis on size, penetration, and success rates. Successful companies always look beyond their existing market success and constantly try to find new opportunities in markets that can ensure future growth. Look-alike targeting is now possible for B2B. Focus your marketing investment on the prospects that look similar to your current best customers. Segmentation helps you predict your best opportunities early and mobilize marketing and sales teams to drive demand with prospective buyers. Segmentation is a highly efficient way to plan go-to-market and expansion strategies that support your growth objectives. For example, the insights derived from segmentation enable you to craft personalized marketing campaigns tailored to each segment. This can apply to both the messaging you use and the channel through which you market. “A scientific approach is not a constraint, but a great enabler. The scientist marketers that we envision are logical and methodical – but they are also free-spirited, adventurous and expansive in their thinking. They are unencumbered by the biases and constraints that so often restrict how adults think and act” (SiriusDecisions).